The expansion of the Nuthatch’s range was described in our First Atlas, and this Atlas shows them continuing to fill in some of the gaps in their distribution and gradually moving towards the north: they were present in one-third more tetrads than twenty years ago (457 to 343), and proven breeding in an extra fifty (239 to 189). The abundance map shows their highest density in the wooded areas around Wilmslow, but Nuthatches can now be found almost anywhere in the county with there are sufficient trees for them to feel at home. The mosslands around the River Mersey used to be a significant barrier for them (BTO Atlas, BTO Second Atlas) but they have now spread across that, especially in SJ69, and are present in most of south Liverpool (Pyefinch & Golborn 2001). Interesting evidence of their continuing spread came from SJ96P, where Steve Atkins noted two birds during 2006 while none was there in the first two Atlas years. The main areas still without Nuthatches are northern parts of Wirral, Halton and Warrington, the Gowy valley and a band across south-central Cheshire from Faddiley (SJ55W) to Cranage (SJ76P). The tetrads without the species are relatively tree-less, for this is one of our most arboreal species, especially favouring mature deciduous woodland: ‘within Europe, the most important tree for Nuthatches is undoubtedly the oak’ (Matthysen 1998). The bark of oaks provides plenty of nooks and crannies from which they can glean food for themselves, mostly adult insects, spiders, larvae, pupae and eggs, and for their chicks, who are fed especially beetle larvae and moth caterpillars. The habitat codes submitted for 85% of tetrads were A1 (broadleaved) or A3 (mixed) woodland. Most of the remainder were suburban or rural human sites (F2 or F3) and Nuthatches readily use large gardens provided that they contain trees and are adjacent to woodland. A few records came from scrub, mostly B1 (regenerating woodland) and farmland with tall hedges; hedgerow oaks are probably important in helping the species’ spread across the agricultural landscape. This is generally a noisy and demonstrative species, not easy to overlook, although they go quiet during incubation. Only just over half of tetrads provided evidence of confirmed breeding, however; in our fragmented landscape, some of the birds in isolated woods are likely to have been unmated (Migration Atlas). Birds were seen carrying food or a faecal sac in 54 tetrads, and fieldworkers in 108 tetrads saw recently fledged young. Nests were found in 77 tetrads, usually in the trunk of a tree, often high up. Nuthatches cannot excavate their own holes, so rely on taking over an old Great Spotted Woodpecker nest or wherever a rotten branch has fallen and left a suitable cavity. If the size of the nest-hole is not to their liking, most Nuthatches use mud to reduce it to fit themselves and exclude most possible competitors or predators. When the nest has been sufficiently manicured, the pair then line it with bark flakes, Scots Pine being especially favoured and often deemed worth flights of hundreds of metres from the nest. During this survey holes in oaks and nest-boxes were the only sites recorded, apart from Hugh Linn’s extraordinary record near Dodleston (SJ36Q) in 2006, when Nuthatches nested in the wreckage of an aeroplane. Along with their expansion of range, the Nuthatch population has increased considerably, the national index being more than 70% higher than twenty years ago. The reasons for their continued rise are unknown, however. 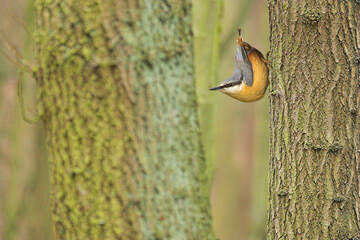 In prime oak habitat, Nuthatches can achieve a density ranging from 2 to 7 pairs per 10 ha (Matthysen 1998). There are few areas in the county as good as that, but an average of more than 12 pairs per tetrad with confirmed or probable breeding according to the BTO’s analysis of BBS transects, which found the breeding population of Cheshire and Wirral in 2004-05 to be 7,770 birds (with very wide confidence limits from zero to 16,440). This figure amounts to 3.9% of the UK breeding population of nearly 150,000 Nuthatches, showing that the county is especially important for them (Newson et al 2008).